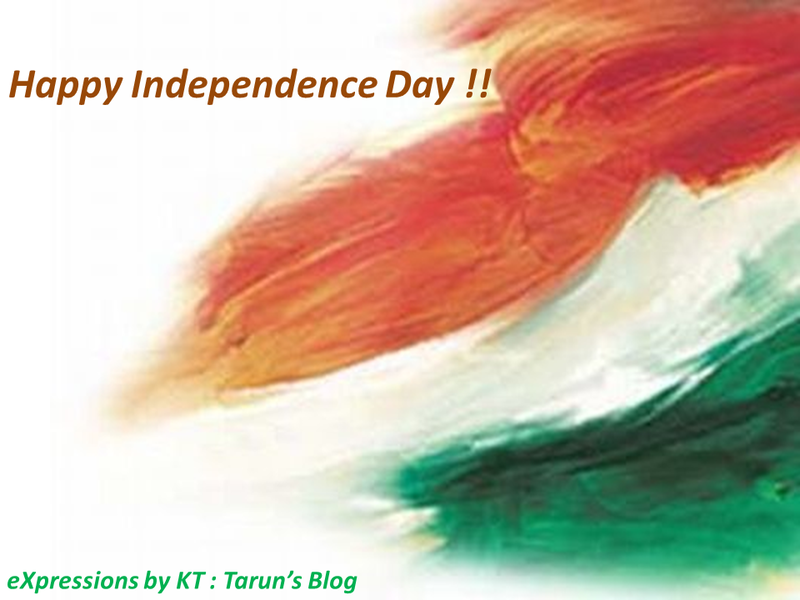 It is the week of Independence Day – the day which gave us this freedom to live a life of our choosing. As the day comes close we are bound to be engulfed in the feeling of respect to this great land of ours. Though it is ironical that we get that feeling only a couple of days of a year but still better sometime than never – right!! This day definitely is the right moment to remember the great leaders who fought for this freedom that we enjoy today. But it is also a time to think if we have really lived upto the dream of these idols who we talk about but never follow. As the new prime minister readies to unfurl the tricolor from the Red Fort and is probably thinking about words to inspire the country, it is for each one of us to take up the task of following our duties and being a responsible citizen ourselves. We all would agree that a lot needs to be improved but never realize our own wrongdoings. We abuse the person driving in wrong lane while we are moving in wrong direction itself! We ask others to not eat in metro when we are sitting on a seat for elderly with a lot of deserving ones standing! We get in middle of line and then shout at next person attempting the same! We want to fight corruption and on the first chance are ready to bribe the thulla on jumping signal! Well some samples on which I have been on both sides of the examples. Today while writing this, I am just wondering if the world would have been a better place had I not been on any of the sides above. Worth thinking – isn't it? Anyway this is not a post to throw gyan on your duties but to get you in mood of the day. Now there is never a better supplement to a mood than complementary music and so I thought of sharing some of my favorite patriotic numbers of all times – ones which are there on my playlist through this week and playing in loop on my car’s music system. As a disclaimer, I am not an expert in music and hence consider this list as a perspective of an amateur guy unknown to the theory of music. This epic song by Lata Mangeshkar was composed as a commemoration for Indian soldiers who died during the Sino-Indian War. Kavi Pradeep was reportedly moved to compose the song by accounts of casualties of the war. The song when performed live at the National Stadium moved Jawaharlal Nehru to tears. This is another song which is based out of the environment in the country post 1962 Sino-Indian war. The movie itself was created on the war and its resulting destruction. The song has become synonymous with patriotism in India. This is a patriotic song about freedom and the independence from the British occupation of India and promises oneself to not let down this great gift of freedom achieved after huge sacrifices. There are few songs that have attained the kind of beloved immortality found in the lyrics of “Mere Desh Ki Dharti.” A rousing declaration of love for the motherland, this song evokes nostalgia, nationalism, and an unwavering pride in traditional values. This beautiful song catches the imagination of all and moves anyone who listens to it with heart. It is difficult to actually relate to the situation of the soldiers, but this song brilliantly brings their feelings as they wait to hear from their families and these letters are only means of interaction with their loved ones. This is a peppy number perfect for dancing and choreography, which clearly points out the world the greatness and caliber of Indian and warns them of consequences in case someone tries an ill-eye on us. A wonderful A R Rahman composition showcasing the feelings of the great freedom fighters who were ready to take on any fight for just one cause – to earn freedom for Indians. Beautifully composed song which gives a inspiring message to the Jawan of this great nation fighting to protect it. This song describing the uniqueness and diversity of this great nations which brings different colours in a single stream to build a beautiful rainbow. I have put here only the ones which I absolutely love and do not claim any exhaustiveness of the list. In case you have suggestions of additions or have views on a particular choice - Shout Out in the Comments !! PS: All copyrights for the songs are with the respective music companies and these are presented here for sole purpose of celebrating this great day. The purpose if purely non-commercial.